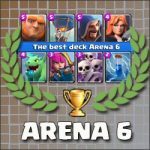 Arena 9 the best Lava Hound deck | Clash Royale fan-site! If you’ve found (or bought) Lava Hound card – you’re lucky! It’s a really powerful legendary card in Clash Royale. Moreover, the combination of Lava Hound and Balloon is one of the most powerful attacking combination in the Game and gamers call it LAVALOON! 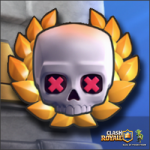 This combination is popular among clash Royale players and meet relatively often. 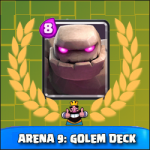 In this post, I’ll describe a decent Lava Hound and Balloon deck for Arena 9, with the help of which I successfully compete on that arena being an 8 level player only. 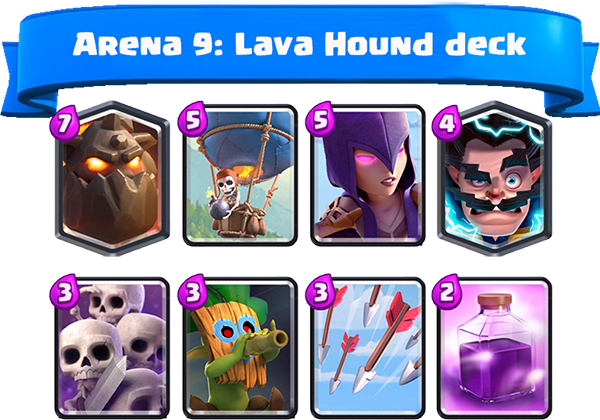 Lava Hound is a legendary card in Clash Royale that costs 7 drops of elixir. Onto arena, this card turns into a big, slow flying creature that attacks only buildings and ignore all other enemy troops. The distinctive feature of this character is that after its dead it divides into a bunch of small Lava Pups, which angrily attack all enemies around them. The only minus of this character is slow speed of movement. Balloon is an epic card that costs 5 drops of elixir. Balloon, just like the hound, also attacks only buildings and ignore all enemy troops. The character of this card has a decent hitpoints and relatively big damage power. Due to these features, this card is a good pair for Lava Hound. The combination of Lava Hound and Balloon (LAVALOON) is a very powerful attacking combination in Clash Royale! Lava Hound and Balloon. The main attacking combination in the deck. While the enemy troops attack the hound, Balloon relatively easy attack a Tower. Witch. Useful card both in attack and in defense. 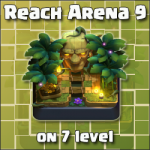 Due to its ability deploy skeletons onto arena can relatively successfully resist against PEKKA, Giant, Prince and other such type characters. Dart Goblin. Quite a good card that unlocks on the 9th Arena. Due to its fast speed of movement, high rate of fire and decent damage power is a great choice for support Lava Hound and Balloon in attack. Skeleton Army. This card for defense purpose mainly. Arrows. The main purpose is eliminating Minions and Minion Horde with the help of which often try to stop balloon or hound. Electro-Wizard. Another legendary card in the deck. This character cops good with Sparky, Inferno Tower and Inferno Dragon. Rage (or Clone). Card for increasing of attacking power. The best time for using LAVALOON combo is the last minute of the battle (time of double elixir). I recommend to deploy Lava Hound first on the lowest part of arena. That allows to gather enough of elixir for deploying other unit and makes attack more powerful. Lava Hound, Dart Goblin and Rage (or Clone). Deploy goblin after the hound and cover both of them with Rage! Don’t deploy goblin until enemy troops and Tower start to attack Lava Hound. Balloon, Skeleton Army and Rage. Such combo works great when opponent spent all his elixir (see video below). I make such trick: 1) I deploy Lava Hound on the one flank. 2) Than, when the opponent deployed his troops for Lava Hound eliminating I deploy Balloon with SKA and Rage on the different flank. You can easily replace Rage with Clone. The effect is also good. But I prefer Rage due to its better effectivity in defense. Tagged Arena 9, Balloon, Dart Goblin, Decks, Lava Hound.